This week in the world of cartoons, we are treated to an amazing Archer season finale that blends two of the best cartoons of the past decade. We also get a very comic book-friendly episode of Ultimate Spider-Man as well a pillow fort vacation on Adventure Time. Gravity Falls is off this week, but will return next week. As always - minor spoilers ahead! Spidey…in…space!!! Spider-Man, Nova, and Iron Fist travel to the moon to aid John Jameson, the astronaut son of Peter Parker’s boss J. Jonah Jameson. John has a super-powered secret derived from ancient moon artifacts (this is beginning to sound like an io9 secret history article…), however, and it’s a hairy one. This week Team Prime is still on the rebound, but the Autobots garner enough forces to launch a counter attack on the Decepticon citadel. Will the Decepticons finally release Predaking to face off against Prime’s forces? Teenage Mutant Ninja Turtles – "Enemy of My Enemy"
Karai is now fully aware of the threat Kraang poses, so the Shredder-follower attempts to team-up with Leonardo and the TMNT. I loved a good pillow fort growing up, and Finn does too. Upset after he told a joke that the Flame Princess didn't like, Finn heads into a pillow fort to start a new life. I wonder if bitcoins work as currency at Taco Bells in pillow fort land – if they do, I’m following Finn. Regular Show – "Limousine Lunchtime"
Some days you eat a meatball sub in the car, and on rare occasions you eat the Italian Sloppy Joe in a limousine. Mordecai and Rigby do the latter in this episode, a limo the duo were tasked to clean. When lunch gets a little messy, Mord and Rigs end up in a limousine demolition derby in hopes of winning a limo to replace the one they sullied. 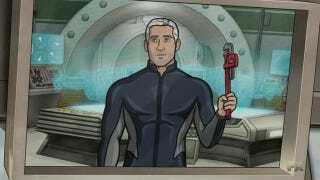 Archer – "Sea Tunt: Part 2"
Captain Murpy & Sealab are threatening to release a number of VX missiles onto the world, leading Archer, Lana, Cyril, and Ray to go undercover as a television crew in Sealab. Lana reveals a rather big secret, but I’m not spoiling it here. Pam also gives a nice discussion of TEOTWAWKI, and my you should include ethanol in your bug-out bag. Archer clips can be a little blue (to steal an ol’ fashioned radio term), so consider them NSFW for you Saturday office dwellers. Top image courtesy of FX. Archer airs Thursday nights on FX, while Ultimate Spider-Man airs Sunday mornings on Disney XD. Adventure Time and Regular Show air Monday nights on Cartoon Network. Transformers: Prime airs Friday nights on The Hub with replays on Saturday. TMNT airs Friday Nights on Nickelodeon.